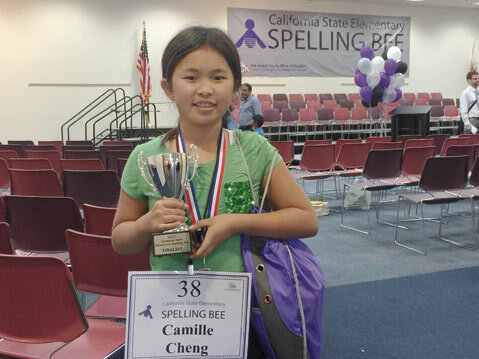 By correctly spelling words such as “correspondence,” “fuselage,” and “emcee,” Camille Cheng, a 6th grader at Montessori Center School, outlasted most of her 54 competitors at the California State Elementary Spelling Bee on April 18. Her parents, Annie and George, and grandparents Quang and Julie were in the audience of more than 300 people as Camille made it to the circle of 10 finalists and left the stage with only five spellers remaining. She won a finalist trophy and other prizes, as well as definite bragging rights.